Attorney General William Barr released a four-page memo over the weekend that purports to summarize the report generated by Special Counsel Robert Mueller report, who led a team of more than a dozen attorneys and investigators in looking into how the Russian government and Russian oligarchs helped interfere in the 2016 U.S. elections in favor of President Donald Trump. Barr, an appointee of President Trump, concluded that there was not enough evidence to bring charges of conspiracy against the president. The memo quoted the Mueller report in saying that Mueller would not charge the president with obstruction of justice, though the report did not specifically exonerate the president from committing a crime. Of course, the president, who has a history of lying, said the next day that the report did exonerate him. Reaction to Barr’s memo mostly fell along party lines, with Republicans wanting to retaliate by starting investigations into Democrats, while Democrats still saying there are too many unanswered questions in the memo. See Rep. Adam Schiff’s response in the tweet below. The common thread among both Republicans and Democrats is that they want to see the entire Mueller Report, which the New York Times reports is longer than 300 pages. Even President Trump has said he thinks the entire report should be released, but that he will leave that decision up to Attorney General Barr. The Trump administration has filed suit to end the Affordable Care Act — referred to by most as “Obamacare” — on the grounds that the law is unconstitutional. President Trump has promised that the Republican party will come up with a better and more affordable plan for Americans, but he has not released any plan, let alone details of what might be included in it. Early in his term, Trump and the GOP-led Congress stripped the law of its “individual mandate,” which required every American who is not covered by health insurance at their job and who also did not purchase insurance through ACA marketplaces to pay a penalty on their tax returns. In the meantime, health care experts are warning of the dire impact on Americans’ health if the law is overturned. The case could end up in the United States Supreme Court. McCallum High School, for the second consecutive year, won the Staff Excellence Award for their overall performance in the contest. We received 2,489 entries from more than 100 schools across the world. Our judges evaluate each submission carefully, and winners will either receive a framed certificate or plaque, depending on their placing. All individual winners receive a Quill and Scroll National Award Gold Key and, as seniors, they are eligible to apply for one of the scholarships offered by Quill and Scroll. Q&S encourages students to apply for our scholarships. To be considered, students must fill out this application if they are an eligible senior who was or will be a winner in our contests. This means any student who has placed first, second, third or honorable mention in either the Yearbook Excellence Contest or the Writing, Photo and Multimedia Contest can apply. Winners from previous years are also eligible. Scholarships can be used for tuition, room and board at any college or university that offers a major in journalism or related areas of communications such as multimedia, broadcast, graphic design, strategic communications, and photography. Apply for the scholarship here. The deadline to submit the application is May 10, 2019. 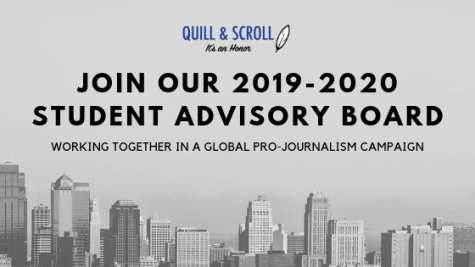 Quill and Scroll’s Executive Director Jeff Browne is accepting applications for the 2019-2020 Student Advisory Board. 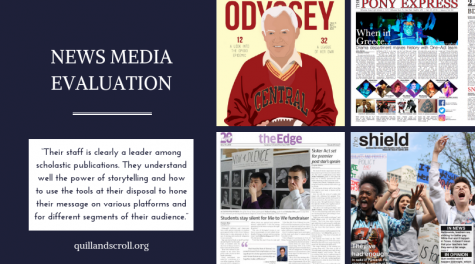 Eight students will be accepted, and their goal and responsibility is to work together on an international, pro-journalism campaign for spring 2020. Board members must be inducted into the Q&S organization before Sept. 1, 2019. However, if you’re already a member, or anticipate becoming a member for the upcoming school year, fill out the form here. The application can be found here, and the deadline for submission is April 10, 2019. The college bribery scandal hasn’t died down. Over the past week, pundits and other commentators have weighed in. This New York Times critic has said wealthy parents don’t bribe elite colleges on behalf of their children. She wrote that they do it for themselves. New York suburb bars anti-vaxxer kids from public places. So the debate over what to do with children whose parents choose not to have them vaccinated against diseases reached the public-policy sphere this week when Rockland County officials decided to institute a 30-day ban on unvaccinated persons under 18 years old in public places. What makes a good 21st-century journalist? Well, Quill and Scroll insists that curiosity, skepticism and language skills should be at the heart of the journalistic endeavor. Researchers have added a few other traits to that list. Click on the story below to find out what they are. U.S. Secretary of Education Betsy DeVos made national news twice this week. First, she proposed cutting her department’s $17 million commitment to Special Olympics. (See video below.) Then she called for more funding for charter schools at a time when the value of charter schools is being questioned in several states.